To Cite: Rashidi M, Ziai S A, Moini Zanjani T, Khalilnezhad A, Jamshidi H, et al. Umbelliprenin is Potentially Toxic Against the HT29, CT26, MCF-7, 4T1, A172, and GL26 Cell Lines, Potentially Harmful Against Bone Marrow-Derived Stem Cells, and Non-Toxic Against Peripheral Blood Mononuclear Cells, Iran Red Crescent Med J. 2016 ; 18(7):e35167. doi: 10.5812/ircmj.35167. Background: Resistance to chemotherapy is a growing concern, thus natural anticancer agents are drawing the attention of many scientists and clinicians. One natural anticancer agent, umbelliprenin, is a coumarin produced by many species of Ferula. Objectives: We aimed to examine the inhibitory effect of umbelliprenin on human and mouse bone marrow-derived stem cells (BMDSCs), peripheral blood mononuclear cells (PBMCs), and different cancer cell lines. Materials and Methods: In this in vitro experimental study, the HT29, CT26, MCF-7, 4T1, A172, and GL26 cancer cells and human and mouse BMDSCs and PBMCs were cultured in RPMI-1640 medium supplemented with 10% fetal bovine serum (FBS), incubated at 37°C for 24 hours in a 5% CO2 atmosphere, and then were treated with different concentrations of umbelliprenin dissolved in dimethyl sulfoxide (DMSO) (3, 6, 12, 25, 50, 100, and 200 µg/mL) for 24, 48, and 72 hours at 37°C. Each experiment was performed in triplicate. Finally, the cell survival rate was assessed by MTT assay. The IC50 values were calculated based on the log values using GraphPad Prism version 5 software for windows (La Jolla CA, USA) and were expressed as mean ± SEM. Results: Umbelliprenin inhibited the cancer cells in a concentration-dependent (P < 0.05) but not time-dependent manner (P > 0.05). The most sensitive and resistant cell lines at the 24-hour incubation time were 4T1 (IC50, 30.9 ± 3.1 µg/mL) and A172 (IC50, 51.9 ± 6.7 µg/mL); at the 48-hour incubation time: 4T1 (IC50, 30.6 ± 2.6 µg/mL) and CT26 (IC50, 53.2 ± 3.6 µg/mL); and at the 72-hour incubation time: HT29 (IC50, 37.1 ± 1.4 µg/mL) and 4T1 (IC50, 62.2 ± 4.8 µg/mL). Both human and mouse BMDSCs showed the highest resistance at the 24-hour incubation time (IC50s, 254.7 ± 21 and 204.4 ± 4.5 µg/mL, respectively) and the highest sensitivity at the 72-hour incubation time (IC50s, 120.4 ± 5 and 159.0 ± 7.3 µg/mL, respectively). The PBMCs of both human and mouse origin revealed very strong resistance to the studied concentrations of umbelliprenin (IC50s ranging from 713.5 ± 499.1 to 6651 ± 3670.7 µg/mL). Conclusions: Our findings indicate that umbelliprenin exhibits concentration-dependent inhibitory effects on various cell types; it is potentially toxic against the HT29, CT26, MCF-7, 4T1, A172, and GL26 cell lines, potentially harmful against BMDSCs, and non-toxic against PBMCs. Therefore, if our results are approved in the future, umbelliprenin can be an appropriate candidate for developing treatments against different cancers. Cancer remains a major challenge for worldwide healthcare systems in the 21th century, and to date, no definitive cure exists for cancer (1, 2). In addition, resistance to chemotherapy and other conventional therapeutics is a growing concern (3), which necessitates further exploration of novel potent agents for cancer treatment from natural sources (4). Umbelliprenin is a coumarin derivative produced by many Ferula species (5) and has exhibited various biological properties (6) such as antioxidant, anticancer (7, 8), anti-inflammatory, and immunomodulatory activity (9). For example, Iranshahi et al. (7) showed that umbelliprenin reduced tumor promotion more effectively than curcumin in tumor-bearing animal models. In addition, Khaghanzadeh et al. (10) showed that umbelliprenin screws immune responses toward Th1 cells through increasing production of IFNγ and TNFα and decreasing IL-4, IL-10, TGFβ, and Foxp3 expression levels in animal models of lung cancer. Hamidinia et al. (11) recently observed that umbelliprenin may exhibit cytotoxic and anti-proliferative activity against colon cancer cell lines. In this study, we aimed to examine the effects of various concentrations of umbelliprenin against different human and mouse cancer cell lines, bone marrow-derived stem cells (BMDSCs), and peripheral blood mononuclear cells (PBMCs), and to define IC50 values for each cell and for various treatment durations. HT29 human and CT26 mouse colon carcinoma, MCF-7 human breast ductal and 4T1 mouse mammary carcinoma, A172 human and GL26 mouse glioma cell lines were purchased from the National Cell Bank of Iran (NCBI) based at the Pasteur institute of Iran (IPI). Human and mouse PBMCs were isolated from blood by Ficoll-Paque (Ficoll and sodium diatrizoate) density gradient centrifugation as previously described (12). Human and mouse BMDSCs were kindly provided by Soleimani (13) of the department of stem cells and tissue engineering, stem cell technology institute, Tehran, Iran. Umbelliprenin was synthesized by the pharmaceutical research center (PRC) of Mashhad University of Medical Sciences (Mashhad, Iran). RPMI1640 medium, FBS, trypsin-ethylenediaminetetraacetic acid (trypsin-EDTA), penicillin and streptomycin antibiotics, and phosphate buffered saline (PBS) were purchased from Gibco Co. (Frankfurter Str. Darmstadt, Germany). The 3-(4,5-dimethylthiazol-2-yl)-2, 5-diphenyltetrazolium bromide (MTT) powder was purchased from Sigma-Aldrich (St. Louis, MO, USA), and DMSO and Trypan Blue from Merck (Germany). Conventional optical (OLYMPUS CX41RF, Philippines) and phase contrast (OLYMPUS CK2-TR, Japan) microscopes were used for microscopical examinations. In this in vitro experimental study, the HT29, CT26, MCF-7, 4T1, A172, and GL26 cell lines and also the stem cells were grown adherently in T-25 flasks containing RPMI1640 medium supplemented with 10% FBS, 100 μg/mL streptomycin and 100 U/mL penicillin (complete medium) at 37°C in a humidified 95% air and 5% CO2 atmosphere. Cell density was monitored using a phase-contrast microscope until 80% confluence density was achieved. The cells were then trypsinized and harvested, and their viability was determined by Trypan Blue exclusion and calculated as approximately 98%. The BMDSCs and PBMCs were also maintained in complete medium until treatment with umbelliprenin. The cells were seeded into cell culture 96-well plates at 5 × 103 cells/well containing 200 µL of complete medium and incubated at 37°C for 24 hours in a 5% CO2 atmosphere. Then, the medium was removed and replaced by fresh complete medium containing different concentrations of umbelliprenin (dissolved in 0.5 µL of DMSO per 100 µL of culture medium) as follows: 3, 6, 12, 25, 50, 100, and 200 µg/mL. Note that due to the hydrophobic nature of umbelliprenin, the minimum possible amount of DMSO was used to dissolve this molecule in an aqueous medium, as previously described (8). The treatment with each umbelliprenin concentration was carried out in triplicate and incubated for 24, 48, and 72 hours at 37°C in a 5% CO2 atmosphere (three plates were dedicated for each cell type). A solution of DMSO and complete medium was used for the control treatment. Data was analyzed, and the IC50 values were calculated based on the log values using GraphPad Prism and expressed as mean ± SEM within 95% confidence intervals. The mean differences were compared by two-way analysis of variance (ANOVA) followed by a Bonferroni post hoc test. The mean differences with P ≤ 0.05 were considered statistically significant. To examine cytotoxic/inhibitory effects of umbelliprenin against various cancer cell lines, BMDSCs, and PBMCs, these cells were treated with different concentrations of the agent (3 - 200 µg/mL) for 24, 48, and 72 hours, after which the MTT assay was performed to assess survival rate of the cells and presented as percentage of control (vehicle-treated cells). According to the toxicity classification by Ballantyne et al. (15), umbelliprenin showed potentially toxic effects against the HT29, CT26, MCF-7, 4T1, A172, and GL26 cancer cell lines at all three incubation times. As depicted in Figure 1, umbelliprenin inhibited expansion of these cells in a concentration-dependent manner. 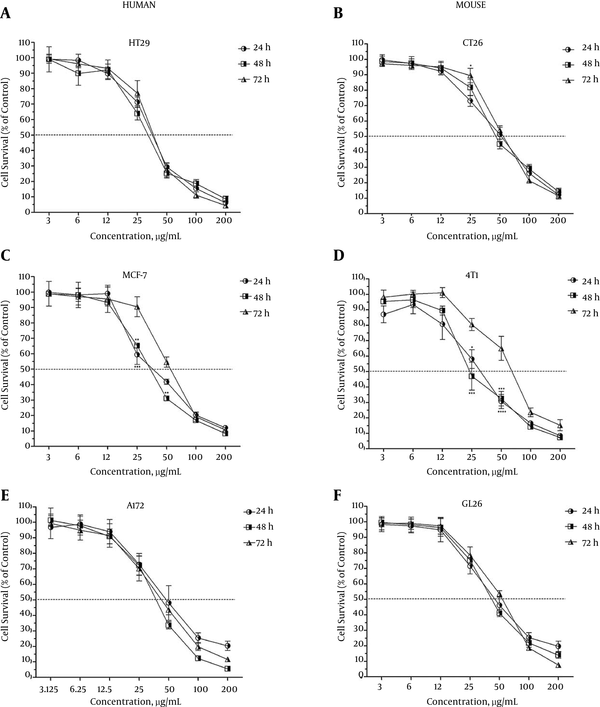 There was no significant difference in inhibitory effects between different treatment durations of umbelliprenin against the HT29 (Figure 1A), A172 (Figure 1E), or GL26 (Figure 1F) cell lines, while in the cases of the CT26 (Figure 1B), MCF-7 (Figure 1C), and 4T1 (Figure 1D) lines, the inhibitory effects of umbelliprenin at the concentrations of 25 and 50 µg/mL when treated for 24 or 48 hours were significantly higher than with treatment for 72 hours (P < 0.05). The survival rates of the treated cells are expressed as percentage of control. Each value represents mean ± SEM of three assays. Umbelliprenin inhibited expansion of the cells in a concentration-dependent manner. 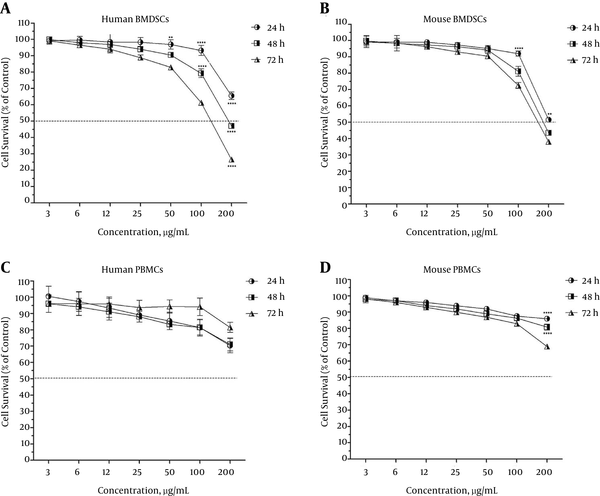 Umbelliprenin showed potentially toxic effects against human HT29 (A) and mouse CT26 (B) colon cancer cell lines; human MCF-7 (C) and mouse 4T1 (D) breast cancer cell lines; and human A172 (E) and mouse GL26 (F) glioma cancer cell lines. The differences with P < 0.05 are presented as *, with P < 0.01 as **, and with P < 0.001 S ***, between the three incubation times. The IC50 is the concentration of an inhibitor where the number of cells or their response is reduced by half. The IC50 values of umbelliprenin for various cancer cell lines for three different incubation times are presented in Table 1. As seen, the most sensitive and resistant cell lines at the 24-hour incubation time were 4T1 (IC50, 30.9 ± 3.1 µg/mL) and A172 (IC50, 51.9 ± 6.7 µg/mL); at the 48-hour incubation time, 4T1 (IC50, 30.6 ± 2.6 µg/mL) and CT26 (IC50, 53.2 ± 3.6 µg/mL); and at the 72-hour incubation time, HT29 (IC50, 37.1 ± 1.4 µg/mL) and 4T1 (IC50, 62.2 ± 4.8 µg/mL). aThe inhibition concentrations of 50% (IC50 values) were measured by MTT assay following 24, 48, and 72 hours of treatment with umbelliprenin. Data is expressed as mean ± SEM, and the parentheses indicate a 95% confidence interval on the mean. Interestingly, umbelliprenin exhibited potentially harmful effects against both human and mouse BMDSCs (Figure 2A and Figure 2B, respectively). In addition, the inhibitory effect of umbelliprenin on the stem cells was concentration-dependent as well as time-dependent; that is, only at the highest concentration (200 µg/mL) and the incubation times of 48 and 72 hours could umbelliprenin inhibit more than 50% of the BMDSCs. As given in Table 1, both human and mouse BMDSCs showed the highest resistance at the 24-hour incubation time (IC50s, 254.7 ± 21 and 204.4 ± 4.5 µg/mL, respectively) and the highest sensitivity at the 72-hour incubation time (IC50s, 120.4 ± 5 and 159.0 ± 7.3 µg/mL, respectively). The survival rates of the treated cells are expressed as percentage of control. Each value represents mean ± SEM of three assays. Umbelliprenin exhibited potentially harmful effects on both human stem cells (A) and mouse stem cells (B) at all three incubation times of 24, 48, and 72 hours. Umbelliprenin was potentially harmful against human PBMCs at the incubation time of 24 hours and non-toxic at the incubation times of 48 and 72 hours (C), while it was non-toxic against mouse PBMCs at the incubation times of 24 and 48 hours and potentially harmful at the incubation time of 72 hours (D). The differences with P < 0.01 are presented as **, with P < 0.001 as ***, and with P < 0.0001 as ****, between the three incubation times. More interestingly, umbelliprenin was revealed to be non-toxic or potentially harmful against PBMCs, depending on the incubation time and origin of the cell. It was potentially harmful against human PBMCs at the incubation time of 24 hours and non-toxic at the incubation times of 48 and 72 hours (Figure 2C), while it was non-toxic against mouse PBMCs at the incubation times of 24 and 48 hours and potentially harmful at the incubation time of 72 hours (Figure 2D). The PBMCs of both human and mouse origin revealed very strong resistance to the studied concentrations of umbelliprenin (IC50s ranging from 713.5 ± 499.1 to 6651 ± 3670.7 µg/mL). A short line of evidence shows that some Ferula species have cytotoxic activity against various cancer cells (16, 17). However, umbelliprenin, extracted from many Ferula species, has shown controversial effects at different concentrations on various cancer cell lines (8, 11). Thus, in the current study, we examined inhibitory effects of different concentrations of umbelliprenin against various mouse and human cancer cell lines in comparison with BMDSCs and PBMCs. We also defined an optimum treatment level, specifying appropriate concentrations of umbelliprenin as well as optimal treatment durations, at which umbelliprenin maximally inhibits cancer cell growth, while having no potential toxic or harmful effects against the normal cells. To the best of our knowledge, our study is the first in this realm. Our results showed that umbelliprenin has potent inhibitory activity against malignant cells. We found that the inhibitory activity of umbelliprenin was markedly more pronounced against breast cancer cells, with glioma and malignant colon cells showing lower susceptibility to the drug. Also, umbelliprenin displayed a potentially harmful activity against the BMDSCs and non-toxic or potentially harmful effects against the PBMCs, depending on the incubation time and origin of the cell. Our findings support those of Khaghanzadeh et al. (8), who demonstrated that umbelliprenin at lower concentrations has inhibitory activities against adenocarcinoma and lung cancer cells, but no toxic effects on the PBMCs. Moreover, in line with our findings, Barthomeuf et al. (18) have previously shown that the cytotoxic activity of umbelliprenin declines in the order of melanoma, lung, prostate, ovary, breast, and colon carcinoma cell lines. However, in contrast to our findings, Hamidinia et al. (11) have recently reported that umbelliprenin has a moderate cytotoxic activity against invasive cells, but proliferative effects on non-invasive SW1116 cells. Our findings, along with the previous evidence (8, 11, 18), indicate that inhibitory activities of umbelliprenin may depend on the cell type and growth phase and may be equivalent to its proliferation rate. In other words, the higher the rate at which the cells proliferate, the stronger is the inhibitory activity shown by the umbelliprenin. However, a weakness of the present study is that we did not normalize the treatment time to the doubling time of each cell type, which is suggested to be taken into consideration in future experiments. In addition, the most notable finding of our study is that umbelliprenin at the investigated concentrations showed no inhibitory effect on normal, non-cancerous cells. Our results showed that treatment of cancer cells with 30-50 µg/mL of umbelliprenin (depending on the cells’ types) for 48 hours might exert maximal inhibitory effects on these cells, while leaving the BMDSCs and PBMCs almost unaffected. This finding adds to the previous evidence suggesting umbelliprenin as an appropriate anticancer agent, which leaves minimal concern about cytotoxicity against healthy organs of a patient’s body. The mechanism or mechanisms underlying the inhibitory activities of umbelliprenin have yet to be clearly determined, and a weakness of our study is that we did not characterize the mechanisms responsible for our observations. However, it has been previously described that several mechanisms might be responsible for inhibitory activity of coumarin derivatives, such as cell-cycle arrest at the G1/G2/M transitions of the mitotic cell cycle, tubulin polymerization, and induction of mitochondrial-dependent and -independent apoptosis, mediated by various transcription factors and pro-apoptotic pathways (8, 18-23). Moreover, Barthomeuf et al. (18) demonstrated that umbelliprenin arrests the cell cycle in the G1 phase and induces caspase-dependent apoptosis, and thereby inhibits the growth of human M4Beu metastatic pigmented melanoma cells. Also, Khaghanzadeh et al. (8) have recently suggested that umbelliprenin treatment induces cell death, predominantly apoptosis in cancer cell lines. Furthermore, Shahverdi et al. (24) showed that the umbelliprenin isolated from the chloroform extract of F. persica, at minimal toxic dose levels, exerted potent inhibitory effects on matrix metalloproteinase (MMP). However, there is no clear explanation for the cancer-specific effects of umbelliprenin as observed in our study. Thus, these data together lead to a hypothesis that umbelliprenin might affect various pathways essential for the growth and progression of cancer cells, which needs to be clearly defined in future studies to develop umbelliprenin-based treatments for cancer. In conclusion, our findings indicate that umbelliprenin exhibits concentration-dependent inhibitory effects on various cell types. It is potentially toxic against the HT29, CT26, MCF-7, 4T1, A172, and GL26 cell lines, potentially harmful against BMDSCs, and non-toxic against PBMCs. Therefore, if our results are approved in future, umbelliprenin can be an appropriate candidate for developing treatments against different cancers. The authors would like to thank Dr. Masoud Soleimani for his kind assistance in preparation of the stem cells used in this study. This study is a part of Mohsen Rashidi’s PhD thesis at the Shahid Beheshti University of Medical Sciences. Authors’ Contribution: Mohsen Rashid participated in all parts of the study as main researcher. Seyed Ali Ziai and Taraneh Moini Zanjani designed and provided technical and material supports. Ahad Khalilnezhad participated in analysis and interpretation of data and drafting the manuscript. Hamidreza jamshidi and Davar Amani assisted in acquisition of data and final revision of the manuscript. Conflict of Interest: The authors declare that none has any conflict of interest.